Anthony Cardinal Okogie of Lagos, Nigeria confirms 644 candidates for Lekki Deanery. 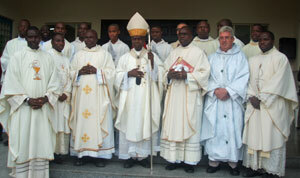 From 19 – 25 April 2010 the Cardinal Archbishop of Lagos, His Eminence Anthony Olubunmi Okogie paid a pastoral visit to Lekki, one of the five deaneries in the Archdiocese of Lagos. Lekki has 9 parishes and 30 outstation churches. At the conclusion of the visit all the candidates for Confirmation were brought to the Divine Mercy Church at the heart of the Lekki Phase 1 area for a ceremony attended by more than 2,000 of the faithful. The Cardinal is pictured here with some of the clergy who assisted him at the 4 hour Confirmation ceremony. Front row, left to right: Fathers Austin Nwodo, Cosmos Mordi, Msgr Francis Ogunmoded (Dean), His Eminence Cardinal Okogie, Anthony Fadairo, Eamonn Finnegan SMA and Joseph Anokerie. Back row, left to right: Fathers Leo Garber, Pascal Aggrey, Jerome Omorgegie, two altar servers, Fathers Gasper Olanrewaju and Leonard Ozougwu.